Remember when you had to buy complete albums made of hard plastic, and play them on a turntable just to hear your favorite song? Then along came the Internet and you could buy 99¢ digital versions of a single song that played on your existing computer. Music got cheaper, available in smaller increments, and easier to use. Organizations today that already use VoIP technology for their phone communication must do everything that they can to maximize the investment that they make into these solutions. 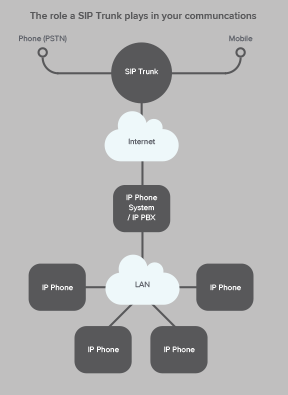 SIP trunking simply refers to calls being routed over a data network. You can think of an SIP trunk line as the virtual version of analog circuits that are provided in traditional phone service. While members of the Voxox team (and our execs) are walking the halls of Mobile World Congress in Barcelona, the folks over at our business division, Voxox In Business, which provides VoIP and unified communications solutions to businesses, are at the Channel Partners Conference & Expo in Vegas this week. This event is huge for us as it allows us to meet and thank our valued channel partners who are the driving sales force of our business products and services.